The moral implications of the world’s energy problem make the Church’s engagement on the subject indispensable. When a coalition of United States scientists issued the most recent draft of its National Climate Assessment, it captured the attention of environmental regulators like me. Two weeks later, the United States Environmental Protection Agency briefed hundreds of researchers and policy-makers about findings from more than two dozen climate indicators. Both the National Climate Assessment and EPA’s indicators provide more than 1,000 pages of science and significant online resources that show trends (mostly negative, but some positive) that align with anthropogenic climate-change models—trends in increasing temperatures; drought in some places while, in others, wetter, stronger, and more frequent storms; changes in agricultural yields; sea-level rise, and other disruptions to the status quo. My professional concerns relate to the impact of storms and rising sea levels on water-pollution control infrastructure. As a Catholic, however, these concerns are illuminated by my faith. This influences my reaction to mounting evidence and professional observations of the impacts of a changing world—and this makes me wonder what we as believers can do about it. Certainly, the topic of human-induced climate change brings debate. This is especially true among my Catholic brothers and sisters who view the topic as a Trojan horse that hides radical left-wing agendas (which it sometimes can). But given pontifical statements on the importance of ecology and the seriousness with which organs in the Church—like the Pontifical Academy of Sciences—consider the subject, there is a growing responsibility for the faithful to look closely at what science is showing, as well as to consider the moral implications of what’s happening, who it’s happening to, and the causes thereof. When governments and environmental advocates consider climate change, they do so in one of two ways: adaptation (which means learning how to live with whatever happens) and mitigation (which seeks to reduce the causes of what’s changing). While these categories are ultimately linked, in practice they are quite separate. Adaptive strategies generally fall to those agencies that maintain our infrastructure and plan future development. Charities—including the Church, which helps those affected by sea-level rise or more frequent storms—also contribute to adaptive responses. We’ve seen this already after Hurricane Sandy in the United States and in the work of the Most Rev. Bernard Unabali, Bishop of Bougainville, Papua New Guinea, who has assisted in the relocation of men, women, and children from the Carteret Islands that have been losing ground—literally—to rising seas. Efforts at mitigation have less-defined champions, but the Church has a considerable voice here, too. The implications of the Holy Father’s exhortations are, as he admits, “major.” That may be an understatement. Moreover, his exhortation is not limited to politicians or environmental bureaucrats like me. It is for everyone. To some degree we all enable lifestyles that demand hefty amounts of gasoline, oil, coal, and natural gas—all of which contribute to a variety of pollution public health and problems such as greenhouse gas emissions that shift how the planet stores and distributes moisture and thermal energy. What concerns me is that, in seeking to engage the energy problem, some colleagues are eager to enact sweeping laws or employ sciences like behavioral modification, similar to smoking-cessation campaigns that parade before us the suffering victims of cigarettes. But the pairing of civil authority and such techniques, while well-intentioned, will be meaningless at best and corruptive at worst without the regulative, supportive, and sacramental graces of faith. Sacrifice can never be legislated. Doing so only harms the dignity of the human person, who has free will. Changing men’s hearts in light of the energy problem and its moral implications will ultimately require the word of God and the grace that pours forth from the sacraments. Reason must wed faith if our policies are to be right, just, and effective. Models of this wedding, of bringing about environmentally friendly ends through faith, are found both in Catholic parishes and universities and in ancient orders like the Cistercians, with their early innovations in architecture, agriculture, and water use—to name a few. The foundations of these innovations elevated Western Civilization at a time when civilization needed it, and they can elevate civilization again. Across the centuries, societies have benefited from the Christian worldview that sees nature and man as good, ordered, related, but fallen—and thus in need of help. From a 2002 paper by Marquette University’s Dr. Jame Schaefer, we hear a particular voice that reminds us of our Christian heritage. “Grateful Cooperation: Cistercian Inspiration for Ecosystem Ethics,” from Cistercian Studies Quarterly, brings to us moderns a 12th-century text that describes the surroundings of the Clairvaux Abbey and the activities of the Cistercian monks who inhabited it. Dr. Schaefer has also explored such themes in her book Theological Foundations for Environmental Ethics: Reconstructing Patristic & Medieval Concepts (Georgetown University Press). The text eviscerates any notion that a concern for ecology is new to Christian thought. Dr. Schaefer and many others provide timely reminders of what the Church offers when nature is under siege by man’s struggle with objective truth and virtue. Within the realm of energy, the results of such ecclesial offerings are already visible. 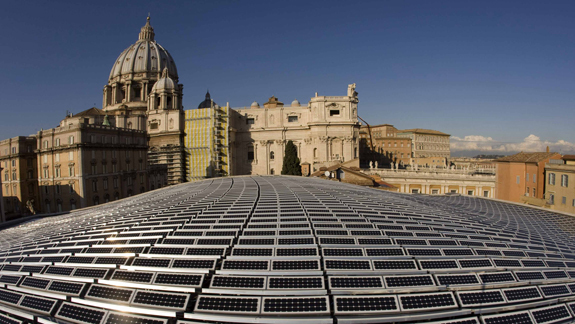 In Rome, the Holy Father has overseen projects such as the installation of solar panels on the Paul VI Audience Hall, helping to make Vatican City the world’s first carbon-neutral state. The news from Maui, Hawaii, is of St. Theresa’s Parish supplying 80 percent of its energy needs with solar panels. In Washington, DC, the Catholic University of America is not just researching renewable energy, it is also benefitting from it with its own sizeable solar installations. The list goes on. And it needs to grow. Having helped groups work with municipalities to reduce energy use, I would add that, to adequately engage the energy problem, there must first be a healthy appreciation of the human person. After all, sacrificial love must be present when seeking to authentically change men’s hearts. Asking an industry, a community, or a homeowner to do things differently is difficult anytime—more so during an age of sour economics. To encourage change, the relational infrastructure that fosters trust, concern, and communication can be provided by the Church—and, in many ways, only by the Church—for two (of many) reasons. Most important, there is what the Church offers: the Gospel of sacrifice and God’s transformative grace. In offering these realities to matters as basic as energy production and use—as did the Cistercians when developing new ways to farm and use water supplies—the Church offers policymakers and politicians (whether they like it or not) what is necessary to build and sustain the relationships necessary to bring about environmentally friendly energy systems and policies. Second, our place in the Areopagus of energy discussion will introduce to many in the post-Christian West (and elsewhere) the many facets of Christian thought and practice, especially those that are often unreported by the media and are thus unseen. The resulting dialogue about matters of science can lead to discussions of faith—which is a form of the New Evangelization. And, with the grace of God, this in itself may lead to the salvation of souls. And so there is much work to be done: Catholic universities and technical communities must continue—and expand—research in energy efficiency and renewable sources of power. This research can then be brought to local parishes and religious orders, both of which rarely have the time or technical expertise to benefit from renewable technologies or the knowledge of state and local financial incentives that can help pay for them. As have the Holy Father and some local bishops already, the Magisterium must raise its prophetic voice to encourage corporations, governments, and individuals to use less and cleaner energy in our industries and modes of transportation. In her teachings, the Church must remove any obstacle hiding the bloody consequences of small- and large-scale violence done to the innocent in the quest by the more powerful to secure sources for our fuel. And not least, in engaging the energy problem, the Church must pray and do penance as much as she preaches and researches. If, as it seems, there must be a change in how we bring light to our world—how we mitigate energy-related social and environmental realities for the good of the many—there must first be individual and communal movement from selfishness toward sacrifice. Such movement is the work of the Church. With our faith in the Crucified and Risen One, believers must once again show—now to a new age—our “grateful cooperation” between the laws of nature and the often inconvenient but necessary Gospel that is powered by salvific love. William L. Patenaude MA, KHS is an engineer and 30-year employee of the Rhode Island Department of Environmental Management. Possessing a master’s degree in theology, he writes at CatholicEcology.net. 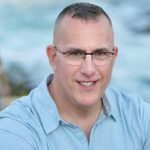 His debut novel, A Printer’s Choice, examines many of the issues noted above and was reviewed for Catholic World Report by Dr. Kelly Scott Franklin.